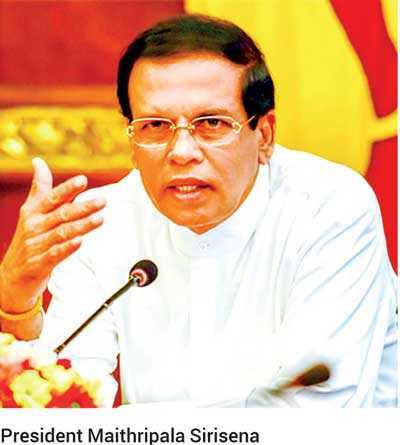 The attempt of Dilkie (http://www.ft.lk/opinion/Bashing-Sirisena/14-669334) to bend the truth cannot be left unchallenged because her (assuming she is a lady by the sound of her name) entire ‘piece of writing’ contains presumptions, twisted facts and fibs. President Sirisena’s speech after swearing-in Ranil Wickremesinghe certainly was a monologue, which was used to justify his unjustifiable act of flouting the Constitution, the basic law of the country, which all politicians including Sirisena have pledged to uphold. His monologue, one-sided harangue I should say, did not provide an opportunity, in the particular scenario for anyone to counter any of the ‘half-baked truths’ and some of his preposterous allegations, he uttered using the media to full advantage. Dilkie seems like a blind follower of Sirisena when she says ‘calm and quiet delivery’ when in real truth his facial expressions were full of vengeance for all to see. The Central Bank bond issue was investigated by the commission appointed by the President himself. Though there were certain findings against the involved primary dealer and certain Central Bank officials, they have to be established in courts with evidence and the correct figure of the alleged loss apparently is still being computed under a forensic audit. Therefore no one including Dilkie’s idol cannot come to any conclusions yet. With regard to the findings of commissions, he failed to explain why the Presidential Commission findings on mass-scale corruption, etc., that found his choice of a Prime Minister, his siblings and progeny plus ‘lackeys’ guilty of misuse, abuse and siphoning out, the wealth of the country for nearly 10 years before 2015, were not pursued and the named perpetrators were allowed to roam free and engage in political activity. The present cases that are before courts were based on complaints made by others like JVP and civil society organisations. The selections of nominees to high office were done by the Constitutional Council by a democratic and transparent process and finally approved by the President. He cannot now lament on his own appointments. If he wants to show his bona fides, he should start probes into the infamous hedging deal in petroleum that cost billions to the country, Greek bond fiasco, again costing billions, the removal of a Chief Justice on frivolous charges with Rajapaksa lackeys in the then Parliament acting as judges, removal of the Commander of the Army by a spurious court martial on trumped up charges, spending billions of borrowed money to construct a non-productive harbour and an airport, and in the process pocketing millions as kickbacks. He was a key cabinet minister and an official of the ruling party when the previous regime allowed such corrupt acts to be carried out, not forgetting the fact that major drug dealers and illicit brewers to import ethanol to concoct illicit liquor to engulf the youth of this country, underworld characters and rapists to be elected to Local Government bodies, pickpockets and unrefined thugs to be elected to Parliament itself, also appointing LTTE killers as party officials and chief ministers. Can one pardon the turning of a Nelson’s eye on these immoral activities? He made very serious allegations against Mahinda Rajapaksa about the threat to his life and various corrupt acts. Has he got any serious charges like that against Ranil Wickremesinghe? One insinuation he makes is based on a complaint made by one person on an alleged assassination attempt by a top Police officer which is yet to be established with irrefutable evidence. The outcome of the CID inquiry will reveal the truth soon. In his ‘monologue,’ he failed to justify his recent acts, one of them being the dissolution of Parliament that was found to be a violation of the country’s fundamental law, the Constitution, by the Supreme Court of Sri Lanka with a seven-member bench in a unanimous decision. The writer bemoans the incongruous insults both in attitudes and actions allegedly suffered by President Sirisena at the hands of the upper class UNP bandwagon. In contrast, it was President Sirisena who acknowledged that he was elected president in 2015 mainly due to the support he received from Ranil Wickremesinghe who sacrificed his opportunity to contest as president and the UNP workers and supporters at all levels. He accepted this in no uncertain terms on several public meetings and at personal discussions with friends and his own party men. Sirisena agreed to become the common candidate because of the strength of the UNP and persuasion by civil society leaders like Ven. Maduluwawe Sobitha Thero who led the movement for a democratic society. He assumed courage to contest because of this powerful lobbying and the force behind it, obviously the UNP.